No time to rest for Robin, he's been over to Leeds University, managing to fit his students in before his next trip. So today I am going to mention something completely different, but related to us, as a family. The other day I did a post on an interview with 'Lancashire magazine' and in it I mentioned son number one getting publicity in his own right. You can read that blog here. Since then there have been a few people wanting to know what it is that he has done. Well, I'll put you out of your misery, and save you a lot of time searching, he is something of an actor. From a very young age he has always been fascinated by anything to do with film or the stage. At the age of 7, he was given the part in a short film called 'Lollipop'. This was directed by Scott Mann, of Shakabuku Films, and did very well, being shown at Cannes Film festival back in 2005, and the 'Kinofilm 10th Manchester International Film Festival' in 2006. Since then he has made another short film, and a number of corporate videos. Although I have added a link to 'Shakabuku Films' they appear to currently be having a few technical problems, probably due to high levels of hits as 'The Tournament' is attracting huge publicity, so you may have to check back later. On the strength of his performance in 'Lollipop', he was initially given a role in Scott Mann's feature length film, 'The Tournament', but, unfortunately the part of the child was later removed from the script. 'The Tournament' is going to be incredible, I've seen the trailer and it's very exciting. It was filmed last summer in Bulgaria, with Ving Rhames, Kelly Hu, Robert Carlyle, Nick Rowntree , Danny John Jules and many others. It is currently in the post production stage, but if you like action thrillers then I suggest you watch out for it. As Shakabuku films go from strength to strength, 'Lollipop' has now appeared on YouTube, and we therefore feel able to put it on the blog. 'Lollipop' is a short, intense drama, about a little boy witnessing the death of his older brother, and then helping his father come to terms with this tragic loss. The film is shot through the eyes of, yes, you got it, son number one, our very own Oliver Hill. This was an incredible experience for all involved, Scott Mann was exceptional as a director, Nick Rowntree an inspiration as Oliver's father, and both have continued to support and advise him since. His mother was played by Marie Hynes, and brother by Jack Eadie. He caused quite a stir on the set, being dubbed by the crew as, 'Mini De Niro' due to his ability to concentrate, and the depth of emotion he was able to put across on camera. As you can imagine, this was all quite a shock to us as parents. Oliver had no training, but, we were told, that was what they liked, his natural ability and ease in front of the camera. In fact the cameraman, who had just completed 'Sixth Sense' at the time, told us he was "exceptional". So, that's what son number one does. We don't know what the future holds, it is after all a precarious profession. But I feel sure he will be involved in films, one way or another. For now though, get a box of tissues at the ready, and enjoy, 'Lollipop'. I didn't need to worry. In the end there wasn't time for Robin to go and try out a few guitars, so he went straight to the airport. It was a shame really, as it is always good to keep your eye on available instruments, and Robin gets a great deal of pleasure from it. It is however one of the few things that causes him to break out in a sweat. He just gets so excited by the whole thing that he can't help himself. He once tried out some flamenco guitars in Seville. It was 40 degrees outside, and Robin remained calm and cool, until we got inside the shop! So for the comfort of the other passengers on the flight home it's probably a good thing he didn't go. But as he is a frequent visitor to Southern California, I'm pretty sure he'll get there in the end. After an overnight flight from Los Angeles to Paris I had a call this morning with a jovial Robin claiming the flight 'etait un morceau de gateau'. His humour has gradually declined as the day has progressed, especially when he saw a flight leaving for Manchester, but couldn't get on it as his luggage was checked onto a later plane. Today Crystal Symphony arrives in Los Angeles and Robin will be making the long journey home. He has enjoyed the trip, his concerts have both gone very well, and he has caught up with a few friends. Mark Merchant I have already mentioned, but the pianist Naki Ataman, has also been on board. He's an interesting chap, he started playing at the age of 4, and made his stage debut at 8! Naki is the son of the concert violinist and conductor, Zeki Ataman, who used to conduct many Turkish orchestras. Naki had an interesting story, and one that may appeal to any conductors out there. At the time, occupations in Turkey were given an unofficial ranking, with musicians pretty high up on the list, and conductors in particular, being held in very high esteem, with a ranking the equivalent of a General! However I have other things on my mind today. As I have said, Robin will be leaving Crystal Symphony in Los Angeles. I do have a concern. In Los Angeles is one of Robin's favourite shops, and you guessed it, they sell guitars. Not just any old guitars, but concert guitars. I also know that he will have time to visit, before he goes to the airport. We have dealt with this place many times in the past, and he assures me he's only going so he can meet them face to face. "It will take more than a knife wielding psychopath with an Oedipus complex, or a serial killer with a chainsaw to deter me..."
Oh, well, I suppose it's OK to look. Yesterday Crystal Symphony spent the morning in Cabo San Lucas, Mexico, a very nice place indeed. In the 40's and 50's Bing Crosby and John Wayne were frequently seen here as they enjoyed the deep sea fishing. Robin: "It's really beautiful here, and I'm just stroking an Iguana, it's being held by a lady, (crackle, crackle, it wasn't a good line), ...wearing a sombrero." Me: "Really, wow, an Iguana, that's fantastic. I suppose the lady should be wearing a sombrero, you are in Mexico." Robin: "No, the Iguana's wearing the sombrero." Once back on board the photographic evidence was forwarded. Word is also out that Robin's nail repair kit has proved very handy. Not only for nails and a President's eyebrow, but you can now add stiletto heel to the list. The final concert went very well and Robin has had some very nice comments. He was delighted to meet a member of the audience afterwards that is an eminent jazz guitarist. I shan't identify him, as he is after all there on holiday, but he enjoyed the concert very much and they spent some time 'talking music'. To receive compliments on your performance from a distinguished musician in his own right, is very nice indeed. This chap is a friend of the legendary jazz guitarist, Lee Ritenour, who has many recordings to his name and has done session work with some of the best around. Herbie Hancock, Steely Dan, Dizzy Gillespie and Pink Floyd to name just a few. So they had plenty to talk about. Another lady said that Robin, "Played with so much soul that she could see it rising out of his body." Whilst one couple announced, "We enjoy your playing very much, we're in the next room." However, they added that both their children play guitar, so they were used to hearing it, and that they had been to both concerts and thoroughly enjoyed them. Also a chance meeting with an American gentleman proved amusing. Last night it was Mark Merchant's turn. Robin was just about to go out to watch Mark's show, when 10 minutes before it was due to start, there was a knock at the door. There he stood, clutching George Bush, minus his right eyebrow. Knowing that this particular guitarist never travels without superglue, in case of any nail damage, Mark was hopeful for some emergency repairs. George Bush now has perfectly symmetrical eyebrows once more, and went on to give an excellent show, with the help of Mark of course. Life's never dull on board Crystal Symphony! For anyone able to get hold of a copy of 'Lancashire magazine', March edition, you will see a familiar face on the front cover, and a lengthy interview with one Robin Hill. Angela Kelly talks to Robin about his musical career to date. I wasn't actually in when this interview took place, but it appears to have gone well, as the article covers a great deal of ground, and makes for very interesting reading. It did cause some mirth in our house though, both children were very amused to hear their Dad described as 'quietly-spoken', not something they are familiar with. Also, son number two was delighted that their ages had been muddled up, and he was now 10. Age is all important to small children. Whilst son number one had been relegated to the meagre age of 5. But he wasn't too phased, he has had enough publicity in his own right, and had his age miss printed enough times, not to be bothered about it. There are even some very nice photographs which show the distinctive markings on Robin's beautiful Miguel Rodriguez, guitar. Well, the pressure is now off Robin as he performed his final concert, of this trip, last night. More details when I get them. I do know that Robin did go into Acapulco yesterday. He allowed himself a little time to relax as he really likes the harbour, and town beyond. One problem everyone faces when travelling abroad, wherever they are, is being inundated with local men, woman and children, trying to take you places you don't want to go, or sell you things you don't want to buy. They go to the trouble of learning standard phrases, in many languages, and it is often difficult to extricate yourself from the situation without appearing rude. Well, Robin has devised a cunning new method. As the locals corner him, and start offering everything, and anything he may desire, (and I mean anything...) Robin has taken to looking straight at them in a bemused way, shrugging his shoulders and gesticulating wildly, whilst muttering, "Mish mash mush," in as thick an accent as he can muster. A path clears around him and he goes on his way. I can imagine these poor people going home and 'Googling' 'Mish mash mush', in the hopes of finding the origin of this new language, so they can become fluent within a few days. Crystal Symphony has spent a couple of days out at sea, so communication has been limited. The last time Robin was on dry land, he ventured into Puntarenus, Costa Rica. He proceeded with caution after the bus driver told him a few facts about the area. Not to be deterred Robin continued into town where he found an interesting shop. His ability to spot guitars at more than 100 paces is legendary. From a great distance he saw a very old shop, with some dusty guitars hanging in the window. But he was to be disappointed. Meanwhile, back out at sea, life on board Crystal Symphony continues. Robin has been enjoying the company of a friend he made some time ago, and occasionally their trips coincide. His name is Mark Merchant and he is a comedian and ventriloquist. He's a very funny man, I know because I've watched his DVD, 'Naked in a Full Length Mirror'. They have also enjoyed attending each others very different performances. Not only that, but they have managed a couple of games of paddle tennis, and eaten out together a few times. He, like Robin, has travelled extensively and worked with many interesting people. On one occasion Mark spent a few weeks opening for Jose Feliciano in Los Angeles. Jose Feliciano is a guitarist, born in Purto Rico, who has managed a successful career despite being blind from birth. After the first week, Mark and Jose still hadn't met. But as Mark walked past Jose's dressing room, his voice called out, "Is that you Mark?" Jose continued, "Hey, good to meet you man, you are a great ventriloquist - I haven't seen your lips move once." Anyway, Crystal Symphony will be arriving in Acapulco later today. I'm not sure if Robin will go ashore this time as his second, and final, concert is tonight. But it's only a couple of weeks since he was there anyway. Mind you, I seem to recall that he liked it very much, so maybe he will allow himself a short excursion. Robin is enjoying some very pleasant weather, as he approaches Costa Rica on board Crystal Symphony, and I think he felt sorry for me back here in the frozen North of England. So he sent me an audio file, of a piece of music he composed during a family holiday in the sun, to remind me of warmer times. He recorded this piece just before Christmas, and wanted to share it with you as a taste of things to come, when he is home long enough to record the rest of the album! The piece is called, 'Fiesta de Xabia'. It was inspired by the bull running festival in Xabia which we witnessed whilst on holiday in Spain. It's an incredible sight, the narrow streets are lined with cages, bulls are released into the street, and the men of the town literally run ahead of the bulls, diving into the protective cages at the last minute. The piece reflects the mood of the whole town. Ominous trills at the beginning signal the tension and excitement prior to the release of the first animal. Then the exuberant theme announces the appearance of the first bull. The increasing virtuosic variations depict the local young (and not so young) men who exhibit an amazing agility in avoiding the horns. The slowing of the tempo towards the end shows the bull majestic as the final victor and the piece finshes with an ebullient restatement of the main theme. For now, you can hear 'Fiesta de Xabia' from the player in the sidebar. Well the first set of concerts went very well. On Crystal Symphony they have a different system. Robin performs one concert of 45 minutes, at 7.30, and then repeats the same performance again at 10.30pm. This is due to the large number of passengers on board and allows everyone the chance to see the recital. Both the performances went well, and with the capacity to hold 600 people for each concert, that's a lot of audience! He did take some time out during the day to go up on deck with his binoculars and try and spot some crocodiles. They are fequently seen basking on the banks of the Panama Canal, but as they were going through a lock at the time, the crocs were nowhere to be seen. His next concert isn't until Thursday, so, Robin can relax for a while and then start preparing his second programme. For us, here at home, it is the last day of half term, and a beautiful sunny morning. So we shall make the most of the day before school resumes tomorrow. Well I don't have any pictures of Cartagena to show you as Robin didn't make it into the town. This highlights the amount of committment required to perform in public at such a demanding level. Rehearsal and practise always comes first. Just before he was about to head off into town, to have a look around, the cruise director called. The forecast for later that evening wasn't good. A storm was brewing out at sea. The show scheduled for that night was a group of dancers. They can't perform if the sea is too rough. Dancing is difficult enough when the stage is stable, never mind if it's pitching and rolling in an alarming manner. At least a guitarist is sitting on a chair...albeit a moving one. So the cruise director put Robin on standby, to swop his concert from Saturday, to Friday. Consequently he didn't go into Cartagena, even though it is one of the rare occasions that it is a port he hadn't been to, and, had told me earlier, looked very interesting. Instead he stayed in his room, and cranked up the practise, to concert day level. In some ways he was ready to get the first performance done. It made for an uncertain day though. Am I performing/aren't I performing. He was told he wouldn't be informed until about 7pm local time. The last I heard from Robin the sea was calm, but the decision hadn't yet been made. He was assuming things were back to plan A, and the dancers would dance, and he would go through the whole pre concert preparation again tomorrow. I haven't heard from him yet today. But I guess that when he gets up, he will be getting on with some serious practise. Even though Crystal Symphony is going through the Panama Canal today, he will just have to look at it through his window, as he gets on with his scales and arpeggios. Robin spent yesterday at sea, and used the time to practise and memorise, 'Cancion y Danza', by Ruiz Pipo. He won't be playing it in concert on this trip, it needs to be firmly cemented in mind and fingers before a public performance, but he will quite likely introduce the piece into his repertoire very soon. Today, Crystal Symphony has arrived in Cartagena, Colombia, and Robin is looking forward to going ashore. From a distance it appears to be an interesting mix of old and new buildings and the area is famed for its emeralds. The port itself is on the Northern coast of Colombia, with two old fortresses either side of the entrance to the harbour. It's has been said that in years gone by, a huge chain was attached to each of the fortresses, remaining out of view under the water. When a pirate ship was spotted, the chain was pulled up, ripping the bottom of the incoming ship, to protect the land from the pirates. Luckily, no such problems today for Crystal. I'm hoping for some nice pictures at some point and will pass them on when I can. Since I last posted, which was only Tuesday, Robin has settled into life on board Crystal Symphony. He has spent a day at sea, then enjoyed the pleasures of Grand Cayman, before returning to sea again. Meanwhile, here, I have been involved in a case of stolen identity. My alert system informed me of a mention, somewhere in cyberspace, of the Hill/Wiltschinsky Guitar Duo. I followed the link, as I normally do, just to check it out. I was therefore amazed to find what appeared to be a blog. The title was one of mine, the entry was one of mine, all the content was mine, but the author had an entirely different name. Someone, somewhere, had gone to the trouble of creating a page, adding my blog entry, making a links section, contacts etc. to give the illusion that they were writing about the duo. I won't give them the satisfaction of a link to show you what I mean, as I'm pretty sure there are dubious and unsavoury connections, but the original post from me was written back in January 2007. This was my version, 'Accidents Happen: Part 1'. Why they should choose this particular entry I have no idea. Why they should choose Hill/Wiltschinsky I have no idea. Why they should choose me I have no idea. The internet is an amazing and informative tool when used correctly. It has opened up the world in a way that wouldn't have even been dreamed of not that long ago. But like most advances there is a downside. It isn't always as it appears. This 'stolen' blog would appear authentic to anyone who hasn't visited the official site. They could therefore follow many of the links to read further, only to find themselves taken to pages very far removed for a classical guitar duo. I assume the owners of this page get something out of it. But I didn't like to linger too long, once I realised what had happened, for fear of some contamination/virus. This occured a few weeks ago, and I haven't had any problems, so I assume they must get some sort of financial reward for clicks on their links. The reason for telling you all this. Well, just to be aware that things aren't always as they seem. Robin has arrived in Miami after a 9 hour flight and was consequently very pleased to be shown his lovely room on Crystal Symphony. He now has a few days to relax and prepare before his first concert on Saturday. I found myself in a strange position yesterday. Then a call from my Mum asking if she could have the children for the night. So, there I was, in the house, alone, except for my three furry friends. Call some friends and arrange a wild night out? Some site maintenance, the observant amongst you will see that I have added Google Ads to the blog. Then I checked out some of my favourite sites and became inspired. Jason Heath has made a really interesting video on 'New Media Marketing for Arts Organizations', and it's well worth a look. It amazes me how he finds the time to be a technical whizz kid, and regularly perform as a musician, but he does. When you are computer illiterate, as I am, it's very nice to have someone out there explaining the fast changing face of the media today, in terms I can understand. Also I noticed that Robin now has a Wikipedia page. Whilst I didn't add this, it is of course, much appreciated. You can find it here, 'Robin Hill (guitarist)', but, if you are searching for it away from this blog, remember to add the 'guitarist' part, otherwise you will find yourself looking at a theme park on the Isle of Wight! It was an early start for Robin today. As he was getting into a taxi at 4.30 this morning, he was already looking forward to coffee and croissant, on arrival at Paris Charles de Gaulle airport. However, Air France were particularly efficient and I had a call from Robin as he waited for take off on his connecting flight. He was rather put out that there hadn't been time to go for breakfast, and the longed for croissant had been denied him. But, at least he will have the opportunity to partake of plenty of coffee on the long flight to Miami. Why is it that the French are so much better at making coffee than we are? Often I take Robin to the airport myself, but, the thought of getting two boys up so early in the morning, and then having to suffer the consequences for the rest of the day, were just too much for me. Esecially as it's half term here, so they will be home all week, without their Dad. Later today, Robin will arrive in Miami and join Crystal Symphony. He has been on this lovely ship many times and always enjoys it. I look forward to hearing from him, when he has settled in after his long flight. The final track on Robin Hill's Eklectica is another composition by the quartets pianist Daniel Bath. 'Waltz', is unusual in the sense that it incorporates singing, electric sitar and the electric guitar. In fact the piece starts with Daniel singing and then Robin joins in on the electric sitar, with its highly distinctive sound. The main section of the piece consists of interplay between the keyboards and electric guitar, with a melodic, laid back, late night listening feel to the whole piece. It's always refreshing to hear musicians obviously enjoying each other's company and making music together. This album brings these factors together beautifully. When you hear the tracks in their entirety, and hear the music 'breathe' and develop, you'll know what I mean. The Bolling in particular is an exciting performance. There aren't many versions of it available, partly because of the unusual instrumentation. I hope you all enjoy this music as much as I do. Meanwhile here at Hillhouse travel plans are well underway. Yes, Robin is off again tomorrow. Leo Brouwer is a Cuban guitarist/composer/conductor who started playing the guitar at the age of 13, giving his first performance at 17. He was initially drawn to the guitar by flamenco music and encouraged by his father, a doctor, and amateur guitarist. 'Danza del Altiplano' is the only solo piece of music on Robin Hill's Eklectica, and is track number 11. "To me it embodies all the best aspects of guitar playing, it's authoritative, musicianly, it's stamped with the personality of the soloist and is full of the sheer joy of playing music on the guitar." There's no doubt it is a beautiful piece of music. Robin frequently performs this piece, and consequently I often hear him rehearsing it pre concert. It never fails to make me stop whatever I am doing to listen. 'Eternal Dance' was originally composed for the quartet and later expanded into a piece for guitar and orchestra. The concerto version can be heard on Robin's 'Virtuoso' album. 'Eternal Dance' has an unusual, but highly rhythmic, time signature of 5/8 with the occasional bars of 7/8. Also, for anyone who wants to try and play it, the piece features a scordatura tuning for the guitar, with bottom E tuned down to C, and A down to G.
The piece is in the key of C minor. The Eklectica version commences with a solo guitar which sets the rhythm for the piece, and gradually various percussion is added. Robin uses rasgueados to reinforce the rhyhthm before Daniel Bath's vocal entry. After the guitar has re-stated the theme, percussion, bass and piano all join in with sparing timpani adding drama at strategic points. Eternal Dance is 5 minutes and 4 seconds long, and as the name suggests, it seems fitting to end by fading out rather than an abrupt conclusion. Consequently Robin finishes on an improvised guitar line, gradually disappearing into the distance. The 9th track on Robin Hill's Eklectica is 'Largo by J.S.Bach'. This is the slow movement from Bach's double violin concerto, where the dialogue between the two violins, has been replaced by the guitar and the piano. Eklectica's pianist, Daniel Bath, did the arrangement, he's an interesting and delightful character, and a musician of many talents. Daniel studied music at Clare College Cambridge where he specialised in Gregorian and Byzantine chant, whilst also playing in the college folk band, 'Batter the Haddock'. He is a multi talented musician with a particular interest in choral music, which he frequently conducts. He continues to study tabla and Indian singing techniques, whilst also performing in his soul band, 'Souled Out'. He has been a frequent visitor to our house over the years, often arriving with a harpsichord in the back of his car, which he would then reassemble in our music room, in order to run through various pieces of music with Robin! 'The Incredible Lightness of Being', which is track 8 on, 'Robin Hill's Eklectica', was composed by Robin, specifically for the quartet. The piece begins with a solo guitar introduction and a fine example of the tremelo technique, which is fluent and rhythmic, setting the tone for the whole piece. After the introduction there is a change of tempo, commencing with the guitar, which plays a demanding and energetic semiquaver sequence, 'moto perpetuo', which continues throughout the rest of the piece. Gradually the other instruments are introduced, starting with the piano. As the marimba joins in I'm afraid the extract then stops, but the piece goes on to culminate with all four musicians playing together. I have always found this piece very intriguing. It draws the listener in and mesmerises with it's constantly evolving repetition in a very satisfying way. An ideal piece of music to sit back, close your eyes, and let the music take you wherever you want to go. It often reminds me of timelapse photography of city life, where the sound of traffic and people going about their busy lives is removed, and replaced with this much calmer and hypnotic soundtrack. Listen for yourself and come up with your own conclusions. Meanwhile here at Hillhouse, Robin is enjoying his time at home, whilst preparing for his next trip. Today his mission was connected with school. Son number two has been enjoying animal/wildlife week. Whilst Robin was away a letter was sent home asking if any parent would like to take a pet in to show to the children. I volunteered Robin, and then let hom know, by email. He got up early to take Miss.Bimps (our chocolate labrador) out for a run in the hopes that it would take the edge off her enthusiasm. Son number two was very excited. It was a huge success. The class of 4 and 5 year olds loved her, and, she was very well behaved. The most amusing part in these situations are always the questions session. There were the usual, "How many walks does she have? ", "Why Miss.Bimps?" (see other entries on Mozart's dog...), but most amusing, "How many dogs are there in the universe?" To which Robin replied he didn't know, and one small boy added, "I think there's about 100." Robin was so pleased he was here to carry out this parental responsibility. One of those occasions that would have been very sad for all concerned if he had missed it. To hear extracts from all the movements from Claude Bolling's 'Concerto for Classic Guitar and Jazz Piano Trio', go to iTunes or follow 'Eklectica' link. Claude Bolling is a French pianist/composer, born in Cannes in 1930. Bolling was a child prodigy and as a 14 year old boy won an amateur jazz contest in Paris. By the following year he had formed his own group which was influenced by the music of Duke Ellington, who had become a friend and mentor. Bolling has also been hugely influenced by New Orleans jazz. By 1948 Bolling was playing with American musicians such as Lionel Hampton, Roy Eldridge and Kenny Clark. In 1955 he formed his own orchestra, known as the, 'Show Bizz Band', which continued performing into the 1980's. He has written numerous film scores and is particularly well known for his semi-classical compositions. The idea of associating jazz and classical music has often inspired a diverse range of musical personalities. George Gershwin, Dave Brubeck and Jacques Loussier, to name a few. Bolling's first fusion was in the 1970's when he composed, 'Suite for Flute and Jazz Piano', which quickly became a favourite for both jazz and classical listeners. The following, 'Suite for Violin and Jazz Piano', commissioned and recorded by Pinchas Zukerman in 1977, was also hugely successful. But it was Bolling's third work of this kind, 'Concerto for Classic Guitar and Jazz Piano Trio', which interests us today. Of the concerto Bolling said, "The writing needed very special attention so that the piano would not predominate over the guitar." This is a known problem when composing for guitar and piano as they do not naturally work well together. Jazz pianists frequently have to reduce their left hand activities to allow the guitar a sonic space in which to be heard. Bolling certainly achieved his objective in the composition of this concerto. The 'Concerto for Classic Guitar and Piano Jazz Trio', is a rarely recorded, and substantial work in seven movements. Robin has collaborated with a group of musicians from diverse musical backgrounds to bring you 'Eklectica'. I have heard 'Eklectica' perform all the music on this CD live, and it really is a fabulous, and highly varied concert. Today we shall look at the seven movements of the, 'Concerto for Classic Guitar and Jazz Piano Trio', of which Robin gave the UK premiere. This movement has a South American theme in 5/4 time, which later alternates with the more seductive jazz feel of 4/4 time. This allows for much improvisation on the piano, and as the movement progresses, both the guitar and the piano alternating and sharing the statements of the opening theme. The guitar part is demanding and we are reminded of Dave Brubeck's 'Blue Rondo a la Turk'. The second movement, Mexicaine, also contrasts two themes. It is said that Mexican street musicians inspired the 5/8 rhythm that dominates much of this movement. Initially the guitar focuses on a nostalgic lament, before the piano, bass and drums develop into a more jazz influenced melody. Invention begins with a baroque dialogue between guitar and piano whilst the bass and drums play an insistent ostinato. The piano and bass then improvise in turn against the main theme, until the guitar reappears to resume their interplay which culminates in the conclusion of the movement. The guitar opens the fourth movement with slow arpeggios developed harmonically. This continues as the piano enters with the theme and the bass and drums enter softly, one by one, to give the movement a bossa nova feel. This movement commences with the guitar playing a long series of perfect major and minor triads until a new pattern develops, commencing with the double bass, then piano, then drums, which is suggestive of a ballad. Here there are two principle themes, fast paced and strongly accented. The first incantatory, the second more melodic, but, rhythmically complex. Robin improvised his own cadenza which heralds the return of the main theme. An excellent sense of timing is required to draw on both the classic and the the jazz elements in this movement. As the title suggests, this is the finale to the whole piece, a reprise of the six preceding movements, and a mixing of the two main themes from 'Hispanic Dance' and 'Mexicaine', to give a fitting and brilliant finale. To hear extracts from all the movements follow the 'Eklectica' link. A new CD is now available from CD Baby and within the next few weeks will also be accessable from all major digital distribution stores. I'm actually quite envious of any of you unfamiliar with these pieces, which will be most of you, as some of them are original compositions! 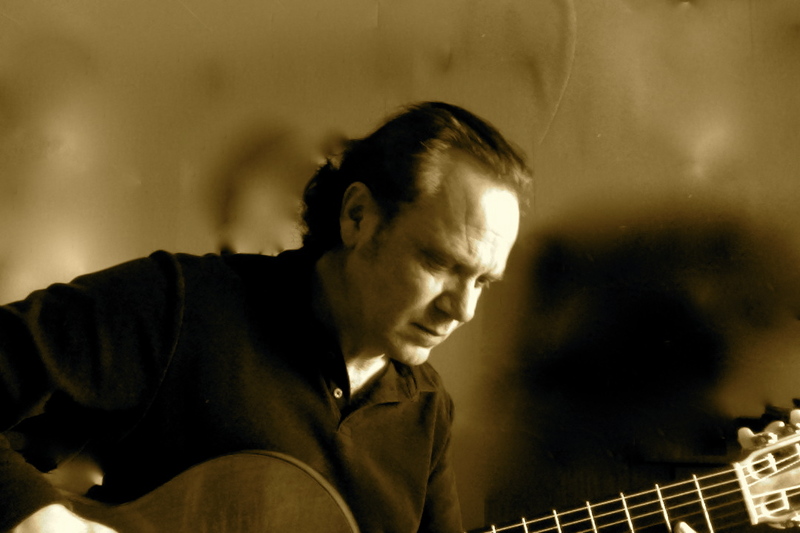 Robin has collaborated with three other musicians to provide an eclectic mix of classical guitar, jazz piano, and, even some electric guitar and electric sitar. For now, go over and have a listen, and over the next few days I'll tell you a bit more about each piece. Here's the link: Robin Hill's 'Eklectica'. Although yesterday there were times when I thought it may have been quicker to go via South America after all! After a long flight from LA, the last thing you need is your connecting flight to be cancelled. Consequently it was some hours later than anticipated when Robin finally arrived home. The delay caused a last minute problem with child care. Thankfully a very good friend held onto our two in the school car park, and they were reunited with their Daddy under the bemused gaze of straggling school children, and the lollipop man. Once home, Robin opened his case, and handed out these beautiful little boxes. They fit together like a puzzle, and are very unusual. Mind you he did get them in Costa Rica. But for now, Robin will just enjoy some time with the family.